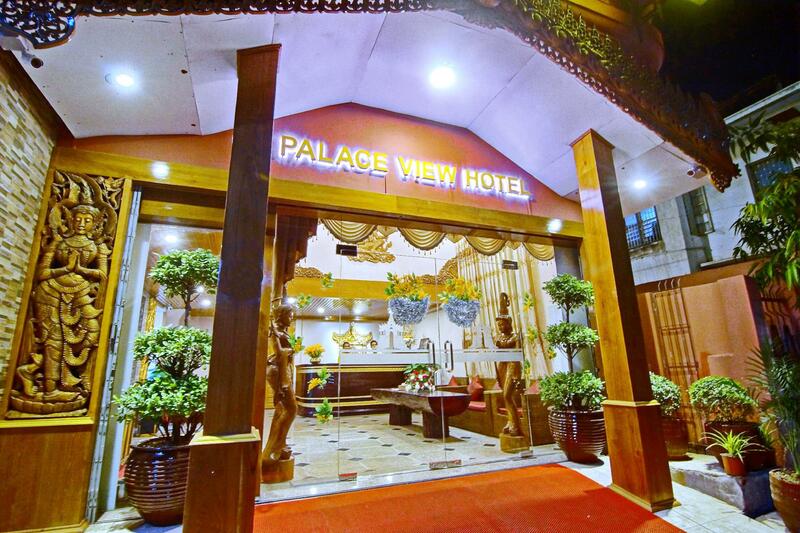 Σε πολύ καλή τοποθεσία της Mandalay, το Palace View Hotel είναι μια πολύ καλή βάση απ'όπου μπορείτε να εξερευνήσετε την σφύζουσα πόλη. Το ξενοδοχείο βρίσκεται 1.4 km από το κέντρο της πόλης και σας προσφέρει εύκολη πρόσβαση σε σημαντικά μέρη της. Από τη βολική της τοποθεσία, η ιδιοκτησία προσφέρει εύκολη πρόσβαση σε κορυφαίους προορισμούς της πόλης. Στο Palace View Hotel, η άψογη εξυπηρέτηση και οι ανώτερες εγκαταστάσεις συντελούν ώστε η διαμονή εκεί να σας μείνει αξέχαστη. Για την άνεση και την διευκόλυνση των πελατών, το ξενοδοχείο προσφέρει 24ωρη υπηρεσία δωματίου, δωρεάν WiFi σε όλα τα δωμάτια, 24ωρη φύλαξη, υπηρεσία ταξί, υπηρεσία εισιτηρίου. Επιπλέον, όλα τα δωμάτια διαθέτουν ποικιλία ανέσεων. Πολλά από αυτά παρέχουν ακόμη και επίπεδη τηλεόραση, δωρεάν καφές φίλτρου, δωρεάν τσάι, δωρεάν ποτό καλωσορίσματος, καθρέφτης προκειμένου να ευχαριστήσουν ακόμα και τον πιο απαιτητικό επισκέπτη. Εξάλλου, το ξενοδοχείο διοργανώνει πολλά ψυχαγωγικά δρώμενα έτσι ώστε να έχετε πολλά πράγματα να κάνετε κατά τη διαμονή σας. Το Palace View Hotel είναι ένας ιδανικός τόπος για να μείνετε αν ψάχνετε για γοητεία, άνεση και ευκολία στη Mandalay. Lovely service. The staff was very helpful. Breakfast was ok. The Room was good. Not everything perfect but they tryed to serve their guests like big Hotels do it. It was very nice. We spend there 2 more nights. Can take this hotel if not too fussy. There's no available power socket for kettle or charging phone. Towels are not very clean. The staff was great, but from the shoddy lobby, the threadbare carpet, thescuzzy bathrooms and thirdrate rooms, this place would be too expensive athalf the rate. Really terrible price/value. You canfind much better in Mandalay gor the same amount. Hotel rooms are a bit smaller and pricey for the moderately old hotel. 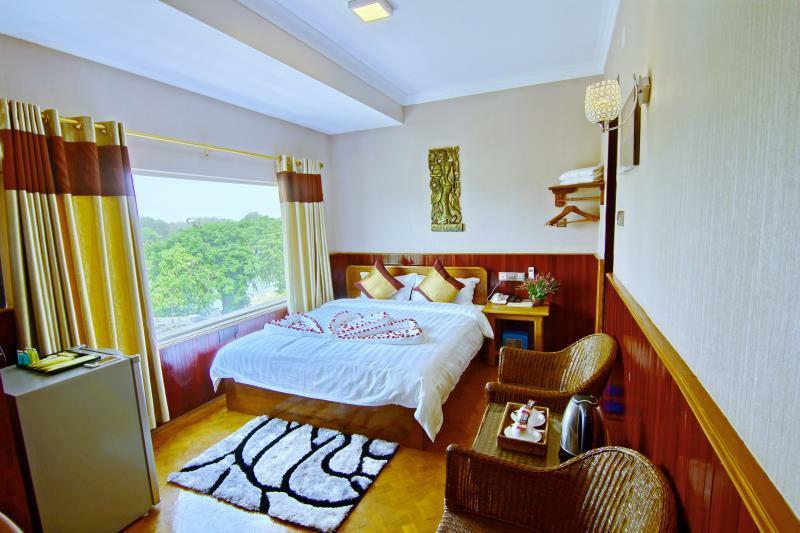 All bed, and couch are all jam packed for a deluxe room. There is no place to hang towel or coats. However, staff are amazingly friendly. Good facilitation (except no hair dryer). Good location. Near good restaurants (Mingala Bar, 1.1 km away, is excellent). Helpful staff: arranged cheap airport transfer for us (13.000 kyat), private car for our city tour... Restaurant: good choice for lunch/dinner if you don’t want to go out. Everything was perfect! 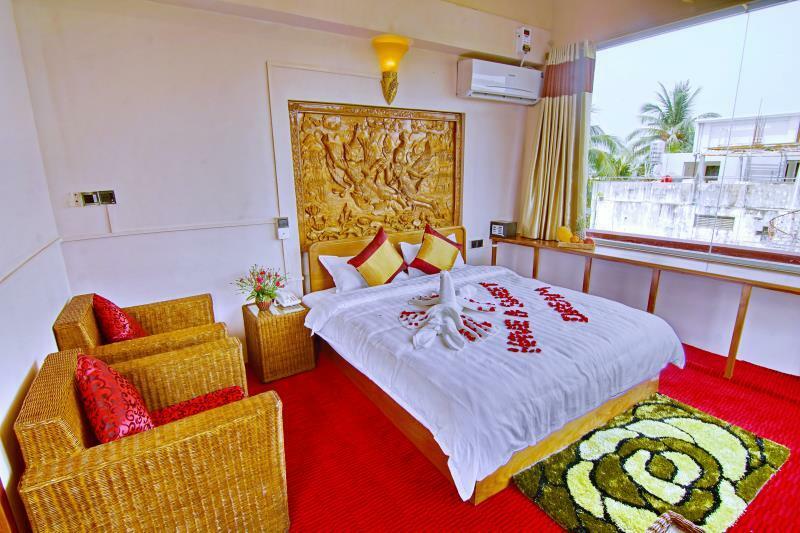 Staff is incredibly helpful and rooms are nicely decorated and very comfortable. We also really enjoyed the bath (very rare for that price in Myanmar). Would recommend this place to anyone. Incredibly good value for money. for the price you need to adjust expectations. my room was a small double but had too much furniture. like 3 small tables. and the bathroom is tiny. however. bed was super comfortable and I slept very well for 2 nights. shower was hot and powerful. staff really friendly and good English. the breakfast is mainly noodles etc. with toast and eggs on request. good coffee and lovely view of palace. as i said the place is not prefect. But I very much enjoyed my stay and thought it was excellent value. I stayed there 3 night on the higher floors. I love you can go almost everywhere by foots. The room I’m staying in is quite small for a 35 dollars per night but they are okay. The breakfast is very basic so I’m not very into it as I’m love to a bit fancy. Over all. Okay. I chose this hotel for its close location to the free Air Asia shuttle bus - not knowing the service had been cancelled. 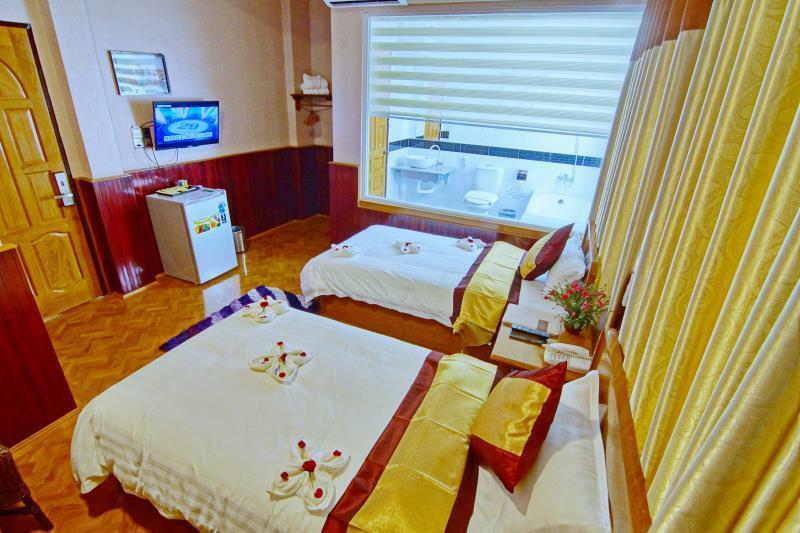 The rooms are fine and comfortable, and the staff very attentive and willing to help. Close to the moat but a bit of a walk to restaurants, etc. I chose this hotel because of the location - overlooking the moat into the old palace - but was pleasantly surprised by the rooms that kept to the theme of royalty and staff who went out of their way to ensure that my husband and I enjoyed the visit and appreciated Mandalay. The hotel is located close to the place-park/wall so we enjoyed at the rooftop restaurant the dinner first and could enjoy every day the breakfast with this nice view. The location is okay and looks save. 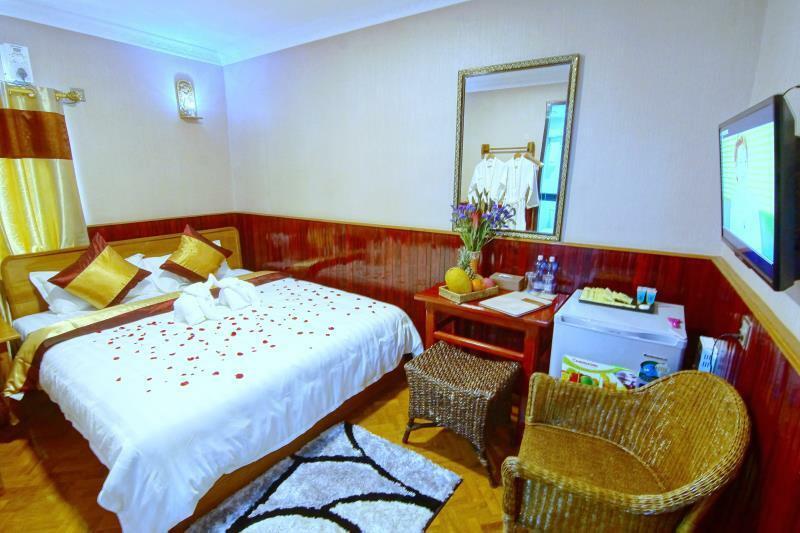 Our room was great and clean and also the service was very friendly. I can recommend it! Lovely and clean room... Hotel very dated and carpet worn but it was very very clean so this made up for it. Lovely reception staff and a nice view of the palace from our room. Only major gripe was that we went to breakfast 1.5hr before breakfast ended and there was no food or juice left. Overall I liked this place. The breakfast was better than some and not as good as others for the same price point. This being said, the standard room's bathroom is not well thought out. In effect, no place to place toiletries to use unless you count the lid of the toilet. Really... adding a simple shelf somewhere within the bathroom would be a HUGE convenience and cost little to do! Staff was quite nice and friendly. It was in the end a good choice for location and needs. Delicious foods but a few menu items. Unclean bed sheet, blankets,towels & pillow sheets.Stayed for 3 days, room service did not make changes any of these. Σιδηροδρομικός Σταθμός Mandalay στα 0.84 χλμ.